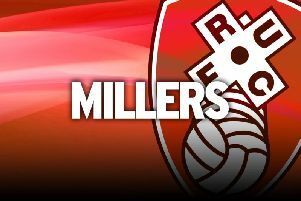 New boy Aidy White is quick to acknowledge the quality of the man he has been brought in to replace at Rotherham United. But the prospect of filling left midfielder Ben Pringle’s boots holds no fears for the Millers’ first signing of the summer. “Ben Pringle was tremendous for Rotherham,” the former Leeds star said after signing a one-year contract at AESSEAL New York Stadium. “He played a massive part in their two promotions up to the Championship and then helped to keep them there. White chose the Millers ahead of four other second-tier sides after parting company with boyhood clubs Leeds at the end of last season. And the words of manager Steve Evans played a big part in the decision of the 23-year-old who played 111 games, the majority of them in the Championship, for the Elland Road outfit. “I’m an attacking left midfielder,” he revealed. “I can also play left-back and on the right side of midfield, but left midfield is where I’m happiest. The Rotherham boss made his move after watching White appear for Leeds as a substitute against his side in the final match of last season. “I had a text from him asking who my agent was,” White revealed. “Things happened very quickly after that. Rotherham are a great club who have had a lot of recent success. I’m delighted to be joining. I met Steve and he outlined his plans for me and the club. I was really impressed with him and what he had to say. White’s eye-catching May 2 cameo against the Millers was his only action of a frustrating season as he fought back from a broken bone in his foot, and he was given a hero’s welcome by the Elland Road crowd as he came on for Alex Mowatt in the 71st minute. “Last year was tough,” he admitted. “The problem should have been sorted out much quicker than it was. I’m 100 per cent fit now and there is a titanium plate in my foot so the injury should never occur again. I’m raring to go and just want to get back playing again. “I’ve been ready since April. The match against Rotherham was my first game back, but I’d nearly played a week earlier against Sheffield Wednesday (a 2-1 win at Hillsborough for Leeds) when I was on the bench. The Otley-born player, who has had loan spells at Oldham Athletic and Sheffield United in the past, admitted it was a wrench to leave the club he joined as a child. But he’s relishing testing himself in a new environment and is already a fan of the Millers’ all-action, pressing style of play, having seen at close quarters the damage it can wreak. “Coming to Rotherham is a fresh challenge for me, one I’m ready for, and I’m really excited about it,” he said. “I know quite a bit about them. I watched them beat Leeds 2-1 back in October when they came back from a goal down and were superb in the second half.